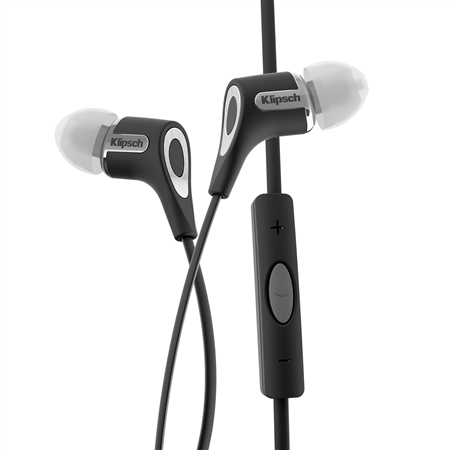 INDIANAPOLIS (March 31, 2014) — Klipsch, a leading global speaker and headphone manufacturer, today announces the launch of the Reference R6 and Reference R6i in-ear monitors. Infused with more than 60 years of audio expertise, Klipsch’s latest offering delivers acclaimed acoustics coupled with unrivaled comfort. With the introduction of these headphone models, Klipsch takes an important first step in streamlining its entire product offering under the Reference name. Rich with heritage, the same advanced acoustic engineering and industrial design from the brand’s legendary Reference home theater speakers provide the performance, voice and design for the R6 and R6i monitors. Constructed from aluminum and elastomer, their sleek construction is lightweight, durable and comfortable. Additionally, the headphones offer flat cabling for added strength and tangle resistance. Equipped with the patented oval ear tips for which Klipsch is known, each model allows for hours of comfortable, long-term wear. Unlike circular-shaped ear tips that put stress on the pressure points inside the ear, Klipsch’s patented oval ear tips naturally fit the contours of the ear canal. These ear tips also offer superior noise-isolation (or passive noise-cancellation), blocking out almost all ambient noise and providing excellent bass. Each model produces the Klipsch signature sound (high efficiency, low distortion, wide dynamic range) via a 6.5 mm dual magnet micro-speaker. This technology provides for a broad frequency range and acoustic detail for the most strikingly realistic sound reproductions of music libraries. Engineered for pure performance, the Reference R6 is available in a black or white finish and compatible with any device that has a 3.5mm headphone jack. It comes complete with a one-year warranty, carrying case and four pairs of different-sized oval ear tips for a customized fit. The Reference R6 retails for $79.99 (U.S. MSRP) and will be available at authorized retailers and Klipsch.com in April 2014. Catering to in-ear enthusiasts on the go, the Reference R6i offers listeners an advanced three-button remote and mic that allows for seamless control of music and phone calls on iPhone, iPod touch and iPod models. Also available in a black or white finish, the headphone carries a one-year warranty and includes four pairs of different sized patented ear tips, a protective carrying case as well as a clothing clip for the in-line remote and mic. The Reference R6i retails for $99.99 (U.S. MSRP) and will be available at authorized retailers and Klipsch.com in April 2014. After 60 years of making the world’s leading loudspeakers, Klipsch utilized its bold audio heritage to revolutionize the headphone industry. Since 2007, the brand has engineered headphones that set the standard for comfort, performance, device compatibility and design. Klipsch has perfected the means for passionate listeners to experience the brand’s iconic sound signature on the go.Klipsch is also a wholly-owned subsidiary of VOXX International Corporation (NASDAQ: VOXX).